Classic Plymouth fans know that muscle cars from their favorite auto production company were known from the beginning for their fancy-looking cars and their sportiness. In the sixties and seventies, Plymouth prided themselves on large engines and inspiring consumers. Somewhere in between all this madness, they branded themselves with the Big Boys of Muscle Cars. Plymouth has proved competitive when it comes to horsepower. One exception was the 413 Wedge, but out of the ashes, came the success of the Mopar’s 410 bhp 413 V-8. The Roadking P9 was priced higher than the other Plymouth cars of their generation in 1939. These cars were offered in four-door and two-door and two-passenger coupe models. The four-door models proved most popular with consumers. This company was known for their hot engines and winning races on the track. In 1967, the first muscle-imaged collection was placed in the GTX. This Satellite-based car stood tall with a 375 bhp 440 cid V-8 engine and only offered the Hemi as the engine option. This car was the first of its kind in midsized cars to display sport-up hood scoops, bucket seats, exciting emblems, large wheels and redline tires. This car was the epitome of Muscle Cars. Plymouth proved their innovation with the Valiant-based Barracuda in 1964. The first cars of this type were strong performers. The 1965 Barracuda contained balanced handling with a 235 bhp 273 cid lifter V-8 engine. In 1967, the company went all out with offering a 383 cid big-block to the options. In 1969, the “Cuda” had a 440 cid V-8 engine. In the early seventies, the Hemi Cuda proved arduous, and remains a highly-desired choice among Muscle Car enthusiasts. The most sought after version of the car is the seventy-version with the spoilered, and striped exterior. The Cuda and Duster were laid to rest in 1975 and was nothing but a memory when the division that produced the cars closed for good in 2001. The Satellite was introduced in 1965 as part of the Belvedere production line. This car proved strong in sales until 1967. With the decline in sales, it was converted to a middle of the line priced model with the GTX. The Fury name was then transferred to Plymouth’s middle-sized models in 1975. Plymouth then allowed the Satellite name to quietly disappear. Plymouth at one point decided to gussy up the Valiant Scamp calling it a Brougham and consumers went totally nuts over the car with purchasing over 127,000 of them. The company admits that this car was never a high-performing car, but they delight in the memories of its popularity at one time in history. In 1997, the Prowler was born (later becoming Chrysler Prowler). This car was also built in 1999 and 2002. The first version could reach 62 miles an hour in 7.2 seconds. The top-speed of this model was 118 miles per hour. The 1999 and 2002 model could reach 62 miles per hour in 5.9 seconds with a top-speed of 126 miles per hour. The 2001 and 2002 models were sold as Chrysler Prowler’s, but DaimlerChrysler strategically marketed the car as a Plymouth in Canada for the 2000 models with this car being the last Plymouth ever sold in Canada. Classic Plymouth car fans enjoy finding these muscle cars for restoration, or if they have the money, and luck, in mint condition. 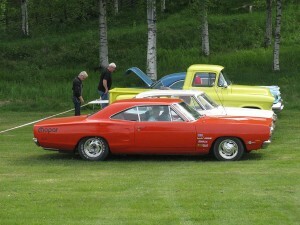 Plymouth Muscle Cars is still an obsession with the sport car enthusiasts. No matter how innovative or fast the current “muscle” cars seem to be, one thing is for sure, they will never have the clout of the Plymouth Muscle Cars.